OK, maybe not for profit unless you consider that you’re saving money by not buying fertilizer and saving the Earth by not putting perfectly good composting material into a plastic bag in the landfill. Fun is arguable too. I find it all overwhelming! On a recent visit to a city-run farm, I wandered way back into the garden that is maintained by the local Master Gardeners’ group. 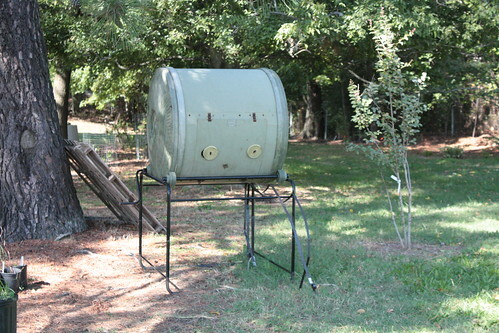 Other than noticing that it was much larger than my last visit, I noticed composting bins. 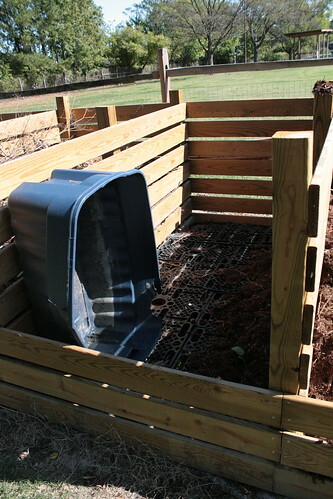 Makes sense that they would have good examples of how to do composting! (Though I wish they had a sign that had more information.) This looks like the type I’m used to seeing with the stages. 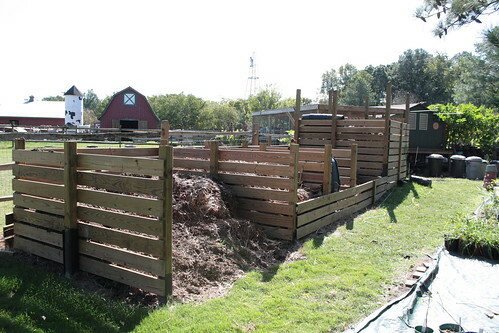 The first pile was manure, then there was an empty one that showed a grate. I guess that’s how they allow air to move around underneath. I’m not sure why that one was empty. The last one that is really tall had a lot of stacked plant pots. There were pots of plants on a tarp near the composting bins. I read about starting a pile each year. When the new year comes, so does a new pile. Perhaps that’s their system? Seems easier than shuffling them down the bin line. They also had the tumbling type that I’ve been thinking about getting. I like that it is contained. Might be easier to move piles of dirt though. The idea of just doing a turn of a drum is appealing. Seems easy. I’m still confused, however. I bought some organic apples this weekend. I hated tossing the core. I don’t do much outside except walk from my house door to the car door, but I know people that would love that apple core for composting! It’d be better put in a hole in my backyard than in the trash. What to do! How to start! Danger! Danger! Overwhelm Mode! 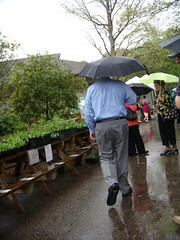 Went to the Virginia Living Museum Native Plant Sale even though it was thundering! What dedication! It was wonderful and had a good turnout. A few of the plants that were favorites were milkweed and butterflyweed because people want to feed/grow the butterflies. I hovered around the Phlox again because I have a dream of one day having a theme garden. Phlox, Cosmos, etc. I enjoyed looking at the not so plant like things such as the carved animals. 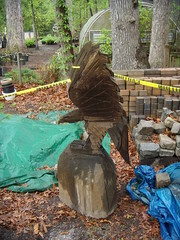 The eagle held up the caution tape to keep us from going near the shed. I didn’t go inside the museum to witness the Earth Day festivities with the animals though. I don’t stay away from my eye drops for too long while I heal from Lasik. They had a great handout on the various plants that they sell and I scanned it for all to read. I apologize for the crinkle and bleeding text. It was raining and it’s very hard to take photos while holding an umbrella and keep a piece of paper dry at the same time. I recommend that if you’re interested in picking up native plants and finding out more about them that you should go to there next weekend. It’s free to check out and the prices are comparable to local nurseries.